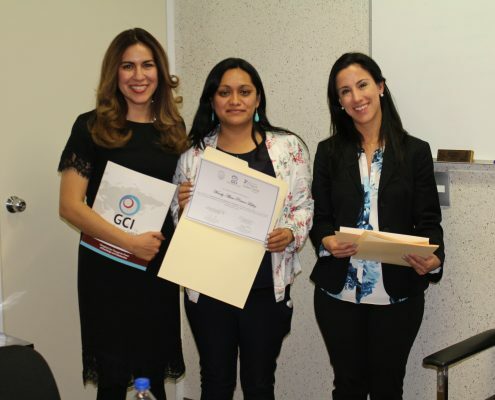 GCI’s first Patient Navigation Program, which launched in Mexico City in January 2016, is already meeting great success. Wendy, the patient navigator for GCI’s Mexico City project, has been working hard to help cancer patients from a secondary level hospital complete their referrals to cancer centers around the city. For Mexico City’s cancer patients, the median time from diagnosis to referral to a specialized cancer center is two whole months, with a range of up to eight months. For Wendy’s patients, the median time to referral is just nine days; in fact, she has navigated all of her patients to a cancer center within a month and a half! And Wendy’s patients love her – in a patient satisfaction questionnaire administered after the completion of navigation, Wendy has received a 100% satisfaction rate for the services and support she provides to her patients throughout their cancer journey. Here, Wendy answers some questions about her role, a typical day for a navigator, and the job’s challenges and rewards. Could you tell us a little bit about your role and responsibilities as a patient navigator? My role as a patient navigator is to guide and to support patients with suspicion or diagnosis of cancer. I help navigate them to a specialized cancer care center, providing them with information and guidance to facilitate prompt attention to reduce the barriers they face. Why is navigation so important for your patients? The importance of navigation lies in being helpful for patients, providing them with support, guidance, and information about hospitals, formalities, and requirements, in order to make it easier for them to gain access to health institutions in a timely manner. Why did you want to become a patient navigator? What is a typical day like for you? Tell us more about a “day in the life” of a navigator! I start by reviewing the daily appointment schedule at the hospital’s services (dermatology, urology, oncology, gynecology). I discuss with physicians whether a patient needs help with a referral to another institution, and I conduct a psychosocial interview with selected patients. After that, I follow-up on my patients by telephone to identify new problems or difficulties and help them by proposing solutions and scheduling or rescheduling medical appointments at more appropriate hospitals. I always make sure that patients are equipped with all the necessary information in order to avoid delays in their diagnosis and treatment. What I enjoy the most it is to identify the main difficulties that the patients face in order to give them the necessary support and guidance to access the health care they need. The limitations of the health system in the country, particularly the lack of a broader financial coverage helping patients pay for their treatments. What has been the most rewarding experience so far as patient navigator? The most satisfying aspect of patient navigation is building a relationship of trust with patients. Such a relationship lets me keep up with them during navigation and, if I identify a problem, it allows me to provide them with information to solve it. This makes the patients feel supported and looked after at all times during their disease. What do you believe is the most important aspect of patient navigation, or the most important thing a navigator can do for a patient? The most important feature is to be a responsible guide. It is also important to have knowledge and skills to be able to work together with patients and their families, health personnel, and institutions in order to chart the navigation route through the health system and make it a positive experience for patients. Is there anything else you would like to tell people about navigation and its importance? I invite all of you to join efforts in the fight against cancer. Let’s look at patient navigation as part of multidisciplinary care that has a positive impact on patients by allowing them to improve their quality of life and obtain access to healthcare in a timely manner. Navigation allows us to overcome barriers in access to health care services and strengthens collaboration between providers. Patient navigation provides the patient with multiple benefits, eliminates cultural barriers, promotes self-care, raises cancer awareness, and promotes early detection. I believe our current patient navigation project can work as a base to develop and implement new healthcare policies regarding cancer care.